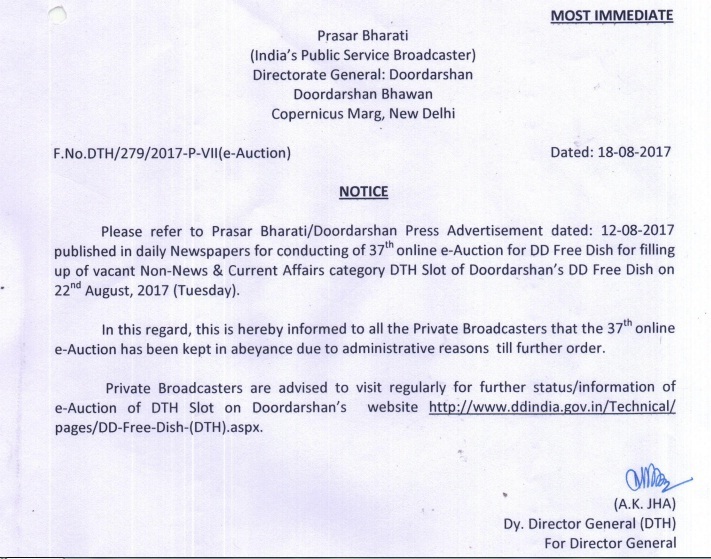 Good news again for DD Freedish viewers that DD Freedish again to conduct online e-auction for filling vacant DTH slots for DD Freedish platform. This e-auction is important because this time all slots are vacant for non-news and current affairs category only. It means no any news channel can take part. This time only you will get entertainment, movie, and music and infotainments channels only. Doordarshan going to held this e-auction on 22nd August 2017 (Tuesday). 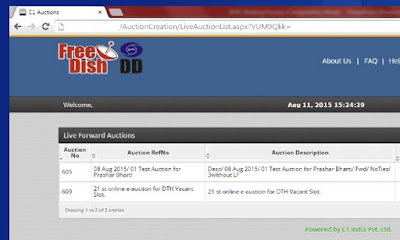 This e-auction is only for Non-news & current affairs category and Doordarshan set reserve price per slot are Rs.8.00 Crores. In this auction only those channels can participate which are registered or permitted by Ministry of Information and Broadcasting under Non-News & Current affairs TV channel category. Any non-news category, interested private TV channels can take part in this e-auction but channel have to pay annual slot carriage fees Rs.8.00 crores. All interest TV channels get online training for bidding process by M/s C1 India Pvt Ltd Gurgaon. At this time DD Freedish carrying 80+ Television channels included News, Music, and International, Sports, Movies and regional channels. 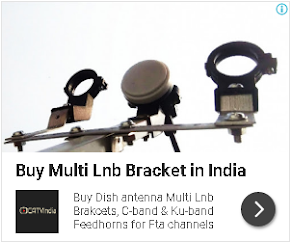 DD Freedish also have 30+ radio channels including All India Radio channels. For more information of this e-auction, visit DD India official website. नमस्कार डीडी फ्री डिश,मैं आसाम से हूं ৷ मैं एक अनुरोध करना चाहता हूं आप लोगों से कृपया एक अच्छा सा Assam (Assamese) टीवी चैनल न्यूज़ हो या मनोरंजन हो Add कीजिए৷ एक new Assamese tv channel “अरुण प्रभा” (DD Arun Prabha) कब देखने को मिलेंगे ? जल्द से जल्द Assamese चैनल Add कीजिए डीडी फ्री डिश पर ৷ Thanks. plz add any pvt/ ddshimla in freedish due to their is no any himachli chnels. All dth services stop any live sports Why???????? Sir, MP ka koi bhi news channel add Kare, z mp/cg, etv mp,sahara mp/cg, bansal news, Inc 24. 38 e Auction kab he bataye. Pls sir free dish par assamese news channels add kriso.